I gratefully acknowledge four people who agreed to contribute to the Foreword of this publication. Our first Chief Minister and the man who encouraged and supported my entry into Territory politics the Honourable Paul Everingham AO. In my assessment, Paul was the most defining political figure since Self Government. Legendary journalist, academic and Vietnam veteran Frank Alcorta MG OAM MiD was there throughout observing, writing and documenting the times. Not always complimentary of my political tribe or me personally he was a 'touchstone' of reality. Martin Albrecht AC the former CEO and Chairman of Thiess was one of the first to offer me a role outside of politics. A 'son' of the Territory he had faith that I could transition the divide between public service and the commercial sector. Dr Christine Fletcher, Director of the Northern Australia Research Unit of ANU in Darwin was the dispassionate observer and chronicler of that 'roller coaster' period of Asian engagement. I gratefully acknowledge Christine's editorial role in completing the Foreword. I thank them all for reading My Story. Very few elected politicians have made the transition from a high-profile political career to a role in the private sector as successfully as Shane Stone. Through enormous energy, the courage to express independent ideas and an astute appreciation of Real Politic, Shane Stone was as comfortable representing his constituency as he was negotiating with world leaders, providing counsel to the Prime Minister, or working closely with Australian business leaders. What follows is a rich personal account of Shane’s life from his childhood in country Victoria, his marriage to Josephine, his legal career and a leap of faith that brought them to the Northern Territory. For many people, the Territory really is the last frontier. Almost 30 years ago when the young Stone family took the leap, the Territory was comparatively under-regulated, under-resourced, but with exciting potential. Shane Stone harnessed that potential and laid the foundations for the path he was to follow, rising to the position of Chief Minister then under the leadership of Prime Minister John Howard, as a highly successful Federal President of the Liberal Party of Australia onward and through to his transition into a career in the private sector. Indonesia is, by proximity and size, of major importance to the Northern Territory economy, and to Australia. That country occupied a large part of Shane Stone’s sphere of interest although it was, by no means, the sole focus of attention: his commitment extended to East Timor, the Philippines and, of course, China. But it was Indonesia that became pivotal to Shane’s life both in the Territory, and beyond. He has a thirst for knowledge and a passion for the Northern Territory and he knew that, if he was to elevate the Territory, he had to build Territory relations with Asia. By that time, Shane had established a solid network of relationships with the business community, the legal fraternity, and he was familiar with the political and cultural nuances of Territory life. As his long time friend and colleague, Martin Albrecht tells it, the relationships Shane formed in his early years in Central Australia were a natural accompaniment when he was elected to the NT Legislative Assembly. It was only natural that Shane would take an active role in the establishment of the PT Thiess Indonesia Advisory Board and, along the way, secure the hands-on participation of one of Indonesia’s leading representatives, Ali Alitas, former Indonesian Foreign Minister and Ambassador to the United Nations (UN). He was a widely respected elder statesman for his country. Shane and Ali Alitas had become firm friends in office and that friendship translated to the commercial arena. “Through a combination of drive and ambition, Shane carved out a career which has taken him from what seems an unexceptional Australian childhood for its time to the highest reaches of politics in the Australian Commonwealth”. “Mussolini once said, ‘Better to live like a lion for a day than a lamb for a thousand years’, not that I would suggest that there is any connection between the Italian dictator and the former Northern Territory Chief Minister Shane Stone, other than the fact that Shane has led a life closer to the lion than the lamb. The latter from the less than favourable launching platform of the Northern Territory, where he attained the chief political office and a spectacular electoral win before losing Office on a short time later, after the loss of the Statehood Referendum. Our storm petrel next emerges as the President of the Federal Liberal Party for most of the period of the Howard ascendency and he clearly didn’t pull any punches when circumstances warranted. Shane has emerged from politics into a commercial career where his qualities will drive him towards the pinnacles”. Within the Territory, Shane built the Asian focus through supporting tertiary programs and conferences and encouraging dialogue between universities and elite Indonesian institutions. One such success story emerged between the Indonesian Institute of Science (LIPI) and the northern arm of the Australian National University - the North Australia Research Unit (NARU). Shane ultimately presided over the establishment of a research-based Memorandum of Understanding (MoU) between LIPI and NARU. Together with this, whenever university based publications emerged, particularly for the then Northern Territory University and NARU, Shane would be there, on the podium, publically launching and promoting the book, and his beloved Northern Territory. In public life, he is as enthusiastic as he is creative. On one occasion, he travelled to Canberra especially to launch an edited book by scholars and others who focused on the economic and governance issues embedded in Australian (and NT) - Indonesian relations. He was accompanied by Dr. Amien Rais, soon to challenge the Indonesian Presidency as Chairman of the National Mandate Party. Politically, the two men were giants but neither are tall: Shane leapt onto a table top in the ANU’s tea room to maximise the effect of the launch and, Dr. Rais immediately followed, leaping onto the adjoining table. Dr. Rais later told a delighted crowd that he copied Shane because he figured that was how books were launched in Australia. That was a defining moment in the relationship between the two men. Coupled to this was Shane’s ability to recognise the fundamental importance of developing world-class infrastructure. He believes infrastructure to be an essential foundation for guaranteeing the Territory’s future. That belief became positively apparent in his drive to attract resources to the Territory and in the strong development of relationships with Indonesia. His leadership, his commitment, and his knack of fostering interpersonal and interregional relations created a lasting legacy in raising the profile of the Northern Territory and shaping key industries: the tourist industry, pastoral, rail, port, off-shore oil and gas reserves - all of the industries that Shane knew were essential to the success of the Northern Territory. During his political career, Shane experienced substantial applause and, as we found out some years later, the occasional hiss. He played to his strengths and the applause was obvious and, as the reader will see, the applause keeps coming. However, the hiss was more subtle, less obvious and probably resulted from a lack of insight. That came in the way some Commonwealth government organisations, notably AusAID and the Department of Foreign Affairs and Trade (DFAT) began to write the Northern Territory’s achievements in Indonesia, out of history. The Asian century paper that emerged under the Gillard Government’s term in Office is a glaring example.6 The focus on yacht races and delegations, rather than on the establishment of historic relations under successive CLP Governments, is telling. Whether that stems from a capacity shortfall in DFAT or a collective memory loss, it doesn’t serve the interests of either Australia or Indonesia. Shane saw development as an across the board necessity: the Territory’s governing structures, the education institutions, strategic policymaking, improving relations with the Commonwealth, and the other States, the economy, law and order, business and industry and, a strong social fabric. He was able to personally identify with all communities, both non-Indigenous and Indigenous, and the Territory’s culturally diverse community, regardless of where they lived within the Territory. He showed enviable leadership in championing all Territory interests. These characteristics were apparent during his election to the Territory Legislative Assembly and in the exemplary manner in which he served his electorate. Among the most profound and lasting legacies of Shane’s time as Chief Minister was his contribution to the Territory’s education institutions, and those in Indonesia. First, he recognised the wishes and needs of Aboriginal people by making it possible for respected church bodies to become accountable for the delivery of education outcomes previously administered by select Government run bodies. Second, he recognised the enormous potential for the Territory to participate in the development of education, cultural and trade ties with Indonesia. The importance he gave to promoting Bahasa Indonesia within the Northern Territory public service, in schools, and in stronger bi-lateral ties with emerging education bodies in the region of Indonesia, contributed long-term benefits not only for the Territory but for the entire Australian nation. 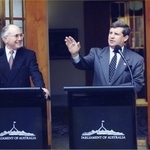 Shane never wavered in his commitment to building the Territory as the ‘Gateway to Asia’, continuing his advocacy during his tenure as Federal President of the Australian Liberal Party. Throughout his term as Federal President of the Liberal Party of Australia Shane demonstrated remarkable focus while providing insightful and constructive counsel behind the scenes to Government on a wide range of domestic, foreign policy and trade matters. He has indeed made a major contribution over the past decade to the unequalled prosperity and international standing of our nation. From very humble beginnings, Shane built an impressive career in the commercial sector, yet dedicated an enormous amount of time and energy to the benefit of his fellow Australians. Last but not least, this is a story by a very personable human being who generously throws open his life to public scrutiny. The book is detailed and fascinating and, to this day, Shane Stone remains a great ambassador for his country.